56% of Adelaide Airport travelers were over the age of 35. 22% of Adelaide Airport travelers were over the age of 60. 3% travelers traveled to ADL with kids under the age of 14. 39% of ADL travelers were millennials. 48% of ADL travelers were female. CAN, SYD, DXB were the most popular destinations visited by First-Class travelers from ADL. Travelers spent an average of 7.00 days in Adelaide Airport. 10:00AM - 11:00AM are the busiest hours at ADL. Every week, at least 203 domestic flights and 225 international flights depart from ADL. 397 flights arrive each week at ADL. 397 nonstop flights arrive at ADL each week. The first flight to ADL departs around 6:00AM - 7:00AM. The last flight to ADL departs around 10:00PM - 11:00PM. June was the month with most bookings for ADL airport. November was the month with least bookings for ADL airport. Book cheap flights to Adelaide Airport with CheapOair and save big! We offer you the most competitive airfares on ADL flights. Choose from our range of ADL flights, and pick the one that suits you the most. We offer incredible Adelaide Airport flight deals that are difficult to miss! The Adelaide Airport is an important international airport located in the city of Adelaide, Australia. It is situated around 6 kilometers away from the city center. At present, it is the sixth-largest international airport in Australia in terms of passenger traffic. 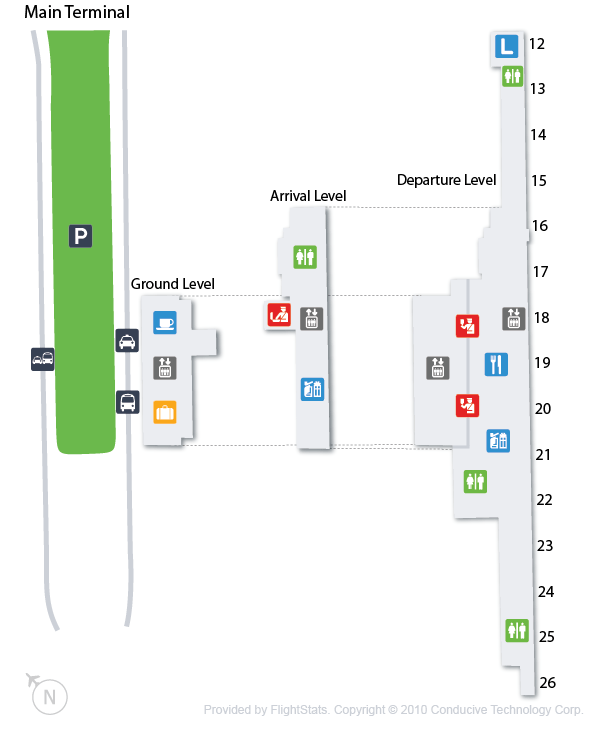 The airport is operated by Adelaide Airport Limited. It serves as a hub for Alliance Airlines, Qantas, Regional Express Airlines, Sharp Airlines, & Cobham and focus city for Virgin Australia & Jetstar Airways. Book flights to Adelaide Airport (ADL) with CheapOair! In addition to offering competitive airfares to locations most convenient for you, we provide useful information to inform your travel to ADL. Read below to learn more about ADL flights, and count on CheapOair for the best deals on all of your travel booking needs. The Adelaide Airport is well connected with the city through various modes of transportation. The bus services, JetExpress & JetBus, are run by Adelaide Metro Bus. Through these bus services passengers can easily commute to and from the airport. The Airport City Shuttle Bus provides door-to-door pickup and drop services to all major hotels and offices within the city. It runs at an interval of around half-an-hour. The taxi rank is located just outside the airport. This is a convenient way to commute between the airport and the city. All options such as taxis with baby capsules, wheelchair accessible, five sealers, maxi taxis, and station wagon are easily available. Travelers looking for the option to explore the region at their own pace can opt for car rental services at the airport. Some of the car rental agencies available at the airport are AVIS, Budget, Europcar, Hertz, and more. Free WiFi facility is available throughout the Adelaide Airport. Two Aelia Duty Free stores are located at the Adelaide Airport. These stores are open for all international travelers arriving and departing from Australia. The Tourist Refund Scheme Office (TRS) has been set up at the Adelaide Airport. Here passengers can claim goods & service tax (GST) and wine equalization tax (WET) refund on certain products. ATMs and Foreign Exchange ATMs are located at several points at the airport terminal. There are three Travelex stores available at the airport, providing currency exchange facility to all. More than 50 major currencies can be exchanged at these stores. A children's play area with a child-proof gate is located at the airport. Also there are several specialty stores at the airport from where one can purchase coloring books, toys, children's books, and more to keep kids busy during the flight. At all points, special assistance services are available at the airport for passengers with special needs. The first aid facility along with the trained staff is available at the airport terminal. Dial Triple Zero (000) in case of any kind of medical emergency from anywhere in Australia. Almost every type of medicines and other travel products can be purchased from the Airport Pharmacy. Post Office and post box are also available for the convenience of the travelers. Smoking is strictly prohibited at the Adelaide Airport. It is advised to use only designated smoking areas while at the airport. A prayer room is also available at the airport terminal. There are baggage storage lockers at the airport where passengers can store various items such as hand bags, shopping bags, motorcycle helmets, strollers, bagpacks, and more. The Duty Free Allowances of Australia allows every adult to import personal goods worth up to AUD900, 50 cigarettes, and up to 2.25 liters of alcohol. Two types of parking options are available for passengers at the Adelaide Airport. The parking area is located near the airport terminal, providing easy access to all. It is a covered, secure, and premium car parking located near the terminal. One can reach the check-in point in few minutes using the sheltered walk-way here. It is most suited for business travelers and also for dropping & picking one's family and friends. It is ideal for parking your vehicle for a long duration. One can either walk or can opt for bus transfer to reach the airport terminal from here. Find cheap hotels in Adelaide - Lowest rates for all sorts of Adelaide hotels!